Get live updates and commentary from Joe Louis Arena as the Bruins take on the Red Wings in Game 4 of their first round Stanley Cup playoff series. I think the funniest part of the Marchand comment is that Iginla has a cut on his cheek that looks like a big red lipstick kiss from afar. Brad Marchand said he gave Jarome Iginla a big kiss for taking him off the hook and allowing him to get some sleep tonight. #fridgealert shuts down for the night. FINAL: Bruins 3, Red Wings 2 ... Iginla with the overtime goal. Actually, that puck went off DeKeyser. 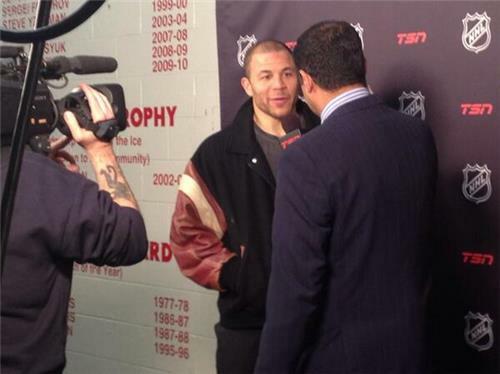 The goal is being credited to Jarome Iginla. First line comes up when it counts. Cycling, strong on walls, net-front presence. Milan Lucic with the game-winner. Bruins take a 3-1 series lead over the Red Wings. Bruins win in overtime, 3-2. Oh man oh man. Another missed opportunity for the Bruins. Henrik Zetterberg's beard is growing by the shift. Gustavsson with another spectacular save. Bruins are getting the chances they want. Milan Lucic The MOST OVERRATED player in the NHL…. period. He WILL cost you a series….just watch….. I don't if he scores a goal (a NY subway turnstile could've scored the same one earlier this eve v. Wings)…. he WILL COST YOU A SERIES. Lots of pressure on Jonas Gustavsson there. The Red Wings got bailed out there by the goalie. Both Rask and Gustavsson with huge saves on what would have been game-winners. Rask denies Abdelkader. Huge opportunity for Red Wings turned back. Repeating the question: Who wants it more? Marchand needed to eat that before missing those two wide open shots! Ugh. As the Bruins' defensive prowess continues to make its mark on the Detroit Red Wings in the Stanley Cup playoffs, the team's top forward, Patrice Bergeron, was recognized for his own contribution to Boston's intimidating defense. Bergeron was named one of three finalists for the Selke Trophy, which is awarded to the NHL forward who best demonstrates defensive mindedness. "It’s definitely a huge honor," Bergeron said. "It goes to the help of all my teammates. There’s no individual awards that don’t go with the help of all your teammates." Thanks to back-to-back wins in Games 2 and 3, the Boston Bruins now have a 2-1 series lead. The Bruins will look to head back to Boston for Game 5 with a commanding 3-1 series lead. The Red Wings may have some added help tonight as they look to even the series up at two games apiece, we will get to that.